May 10, 1862 was a bright, windy day. 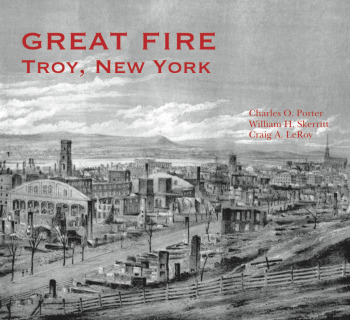 Sparks from a locomotive crossing the Hudson set fire to Troy’s covered wooden railroad bridge and created a blazing inferno. The gale wafted burning bridge fragments into the city, sparking dozens of fires which soon grew into a roaring conflagration, overwhelming firefighting efforts. By the end of the day, 671 buildings on nearly 50 acres were destroyed, with many dead, missing and injured. This book, with 50 period photos, maps and images, tells for the first time the full story of the Great Fire, its consequences, and the subsequent rapid rebuilding of the burnt district.